We introduce ourselves as a prominent manufacturer and trader of an extensive array of Tava Non Stick Pan. The offered tava is designed using superior quality raw material and progressive technology in line with industry norms. Our provided tava is made available in different sizes and designs for our valuable clients. To meet divergent demands of the clients; we bring forth an extensive assortment of Non-Stick Tawa. The product is highly energy efficient and saves fuel due to its even and faster heating. It is made using premium quality material which makes them highly durable and provides the perfect finish. We are indulged in offering Non-Stick Milk Pan to our clients. 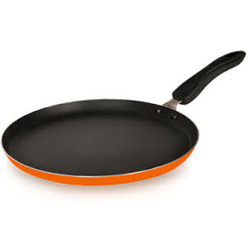 We are engaged in offering a quality tested array of Non Stick Pan. The Non Stick Pan we offer is widely demanded by the clients for their precise use. Safe to use these products are known for their different sizes, models and various others. Besides, our products are suitable for hotel, offices, restaurants and homes.